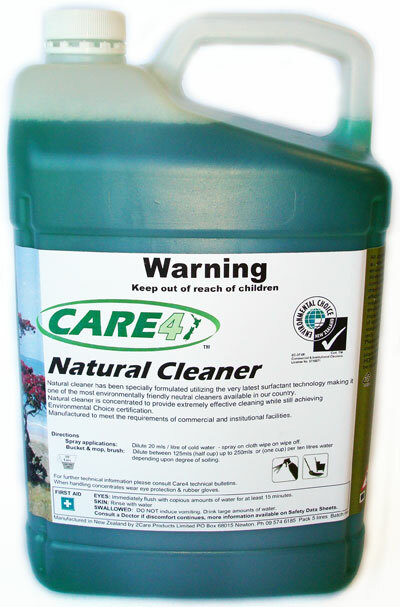 Care4 Products have been created by a team of experts to meet the growing requirement in New Zealand for both high quality high performance cleaning chemicals and formulations that meet or exceed Environmental Choice New Zealand standards. The team with over seventy–five years experience in chemical manufacturing and testing, realised that no one organisation in New Zealand had the experience or focus to produce the depth and range of products now presented under the Care4 brand. Care4 products are produced not just to meet Environmental Choice New Zealand standards but also with full consideration of the best ethical practices taking into consideration both corporate governance and a passion for our environment and New Zealand’s responsibility to our world. The Care4 range includes unique and innovative products designed to make cleaning easier and quicker than other products, and also to be very cost effective in use – there is no need to compromise on performance or by having to pay a “green premium”. Care4 products are very concentrated. This has intentionally been done to reduce the transportation and storage costs that have benefits for us all in reducing our carbon impact. Care4 Products are available through an increasing range of selected distributors throughout New Zealand.